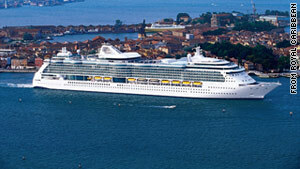 The ship, Brilliance of the Seas, is carrying more than 2,000 passengers. (CNN) -- A violent storm over the weekend lashed a Royal Caribbean ship trying to get to port in Alexandria, Egypt, injuring nearly 30 passengers, shattering glass and overturning furniture. "It was a little scary on Saturday because the boat was rocking down and rocking back up, but you never knew how deep it was going to go," honeymooning passenger Justine Lovelace told CNN affiliate WTNH. The ship, Brilliance of the Seas, was rocked by 70-knot winds early Sunday morning. The winds were nearly twice as strong as forecasted, Royal Caribbean said in a statement. "Some guest injuries were reported, the most serious of which were two guests with fractures. The medical facility onboard is fully operational and our medical team is diligently caring for guests," the statement said. The ship is carrying more than 2,000 passengers. Damage has forced the closure of the ship's beauty salon, video arcade and disco for the remainder of the sailing. The ship's operating systems and engines were unharmed in the storm. The rough weather prompted the captain to bypass Alexandria and continue on to Malta, the cruise's next scheduled destination. The ship will return to Barcelona, Spain, on Friday as scheduled. The ship's next sailing will not be affected, Royal Caribbean said. The cruise line has provided guests with an onboard credit as well as a full refund for the sailing. Cruising website Cruise Critic received accounts of the violent weather from members on its message boards. "I was flying back and forth. My roomie managed to brace herself. The beds were sliding back and forth!! Broken glass everywhere as everything on it went flying. Tables and chairs upended," wrote a member with the handle dirtgirl. On shore, strong winds and heavy rains caused damage to buildings and numerous deaths and injuries, according to Egyptian officials.